I am entitling this post “Neoliberalism” even though what happened in this period was much more than the development of neoliberalism (also known as market fundamentalism) in the world, but that by itself is more than enough. 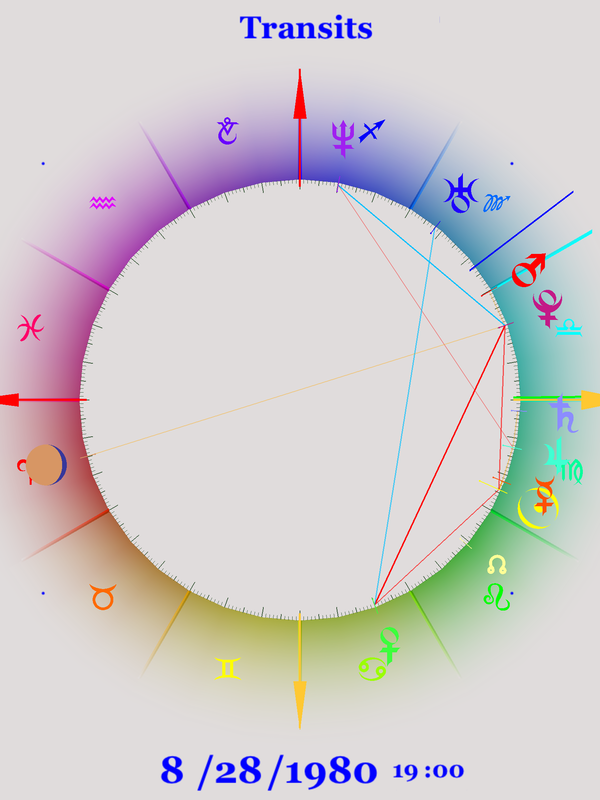 As we’ve seen before at times of midpoint configuration between the three outer planets, things change in such a drastic way that it is hard to remember what life was like before that time. One could call it a “phase change” in society, a watershed moment, or a Zeitgeist (German for spirit of the time) change. First we should define neoliberalism. My favorite definition, which I coined myself, is Market Über Alles, the market above all. Thus the demands of the market supersede anything else: We must lower the taxes on markets and those who run them, privatize everything, the government can not do anything right, regulation of markets (by the government) is bad so we must reduce regulation. These policies have been ascendant since this time; for another look at this phenomena see Merchant, Soldier, Sage: A History of the World in Three Castes by David Priestland. We can see signs of this all around, and it is increasing: privatize the Post Office (it was partially privatized long ago), replace public schools with charter (ie., private) schools, replace the government-run military with private contractors, what use to be called in a simpler time mercenaries. Let the water system be run by private contractors. Replace government-run prisons with private prisons. How about private roads and bridges? And don’t forget medicine; trust the (private) insurance companies to provide you with health care. First we must start with Ronald Reagan. Many people are upset at the title of Sean Wilentz’s book The Age of Reagan, but I realized that it is certainly true. Some President have such a wake that the administrations after them take on some of the same characteristics that the eponymous President’s administration had. Thus we speak of the Age of Jackson from at least 1829 when Andrew Jackson took office to 1861 when a Republican took office, the Age of Roosevelt, from 1933 when Franklin Roosevelt took office until 1974 when the last New Deal President resigned. And finally we have the Age of Reagan, starting when the sainted Ronald Reagan took office in 1981 and still going strong, in fact stronger than ever. Just as I believe those previous two Ages started before the named President was elected, and his election was just a concrete manifestation of the changes that took place in the country’s psyche, the Age of Reagan, the only one whose start I was able to witness, started before Saint Ronnie was elected. One can see many signs of the upcoming age under President James Earl Carter. Among other things, Carter deregulated the airline industry, the trucking industry, railroads, and he started the process of deregulating the telecommunication industry. He also got the CIA involved in Afghanistan before the Soviets invaded, a forerunner of Reagan’s boosting the Cold War. This is much like Roosevelt carrying forth ideas of Hoover to combat the Great Depression, as a member of FDR’s Brain Trust Rexford Tugwell pointed out. Conservatives who are not blind to Carter realize that just as it took a Republican to recognize Red China — as the expression Nixon in China well illustrates — it took a Democrat to realize the “miracle of markets” and start the ball rolling for neoliberalism. In fact, Carter’s final defense budget was greater than Reagan’s first. And he proclaimed the Carter Doctrine, that any threat to Middle East oil is a threat to America, and even force may be used to stop that threat. Carter’s Security Advisor, Zbigniew Brzezinski, early in 1979 convinced Carter to allow the CIA to set up operation against the Soviet-backed government in Afghanistan, hoping to embroil the Soviets in what he called “their Vietnam” in that country. The Soviets took the bait to support the Afghanistan government, and the result was a long and bloody civil war that the next president was more than willing to support. From that came Osama Bin Landen, the Taliban, 9/11, and the continued involvement of America in Afghanistan still 35 years later. What may have seemed like a good idea at the time had long-ranging repercussions and the world is worse for that decision. Another thing that Carter did that helped get neoliberalism started, even though it cost him the 1980 election, was to appoint Paul Volker head of the US Federal Reserve in July 1979 and Volker soon changed the monetary policy of the country, resulting in bad economic conditions that doomed the Carter presidency. Half way around the world, China in 1978 got a new leader in Deng Xiaoping to replace Mao Tse-tung who had died a couple of years earlier. Deng started a massive change in the economic policy of China; he is reputed to have said “To be rich is glorious” which certainly could be a motto for neoliberalism. But the changes that he started in China are well known today in the United States, where it seems that more and more of the products for sale in our stores, whether cheap clothing or expensive computers, are made in China. And in Great Britain in May of 1979 the shopkeeper’s daughter Margaret Thatcher was elected Prime Minister. She served as a good partner for Ronald Reagan, elected 18 months later, to remake the world in the vision of neolibreralism. Her motto was TINA — There Is No Alternative. And she certainly remade England, with her crushing of a coal miners strike being only the most obvious example. And governments after Thatcher, either Tory or Labor, followed the Thatcher formula. Even now Britain’s National Health Service, a beacon for the world, is being dismantled and replaced by private practice. But on a more local level, California passed Proposition 13 in the Summer of 1978 to amend the Constitution of that state. Passage of this had profound implications for the state, and was a trendsetter for the country. The major effect of this act was to limit property taxes in the State of California, which hampered the construction of new schools, among other things. The act also required a two-thirds majority of both houses of the state legislature to change the state taxes. Since it was difficult to get such a majority in both houses, there became less and less money for such things as education, both for public schools and the state university system, which had been relatively inexpensive for residents and had been renowned for its quality. Both those things disappears in the aftermath of the passage of this act. The National Rifle Association — NRA — is famous for their strong stand on the supremacy of the Second Amendment and their equally strong political stand. Many people forget that the NRA use to be a simple organization devoted to gun safety and teaching young people to handle firearms. Then, in 1977, there was a right-wing coup in the organization called the Revolt in Cincinnati; the NRA was taken over by a small band of firebrands and the organization was remade into the NRA we know today. Iran has been ruled by an autocrat who had been put into office by a coup instigated by Kermit Roosevelt, son of Theodore, working for the CIA in 1954; this was Shah Mohammad Reza Pahlavi. His secret police SAVAK were notorious. But in 1979, while the Shah was out of the country, an Islamic revolution occurred which toppled the government that had been strongly backed by the United States. Ever since that time Iran has been ruled by an Islamic government and has been severely opposed by the United States government, which still does not have diplomats in that country. 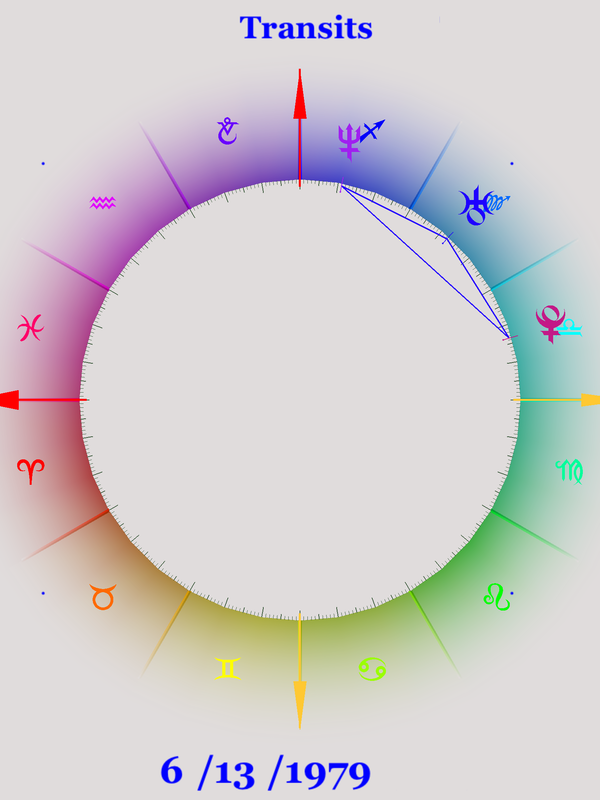 This graphical ephemeris show a period of five years from the middle of 1976 through the middle of 1981, with the center at the start of 1979. 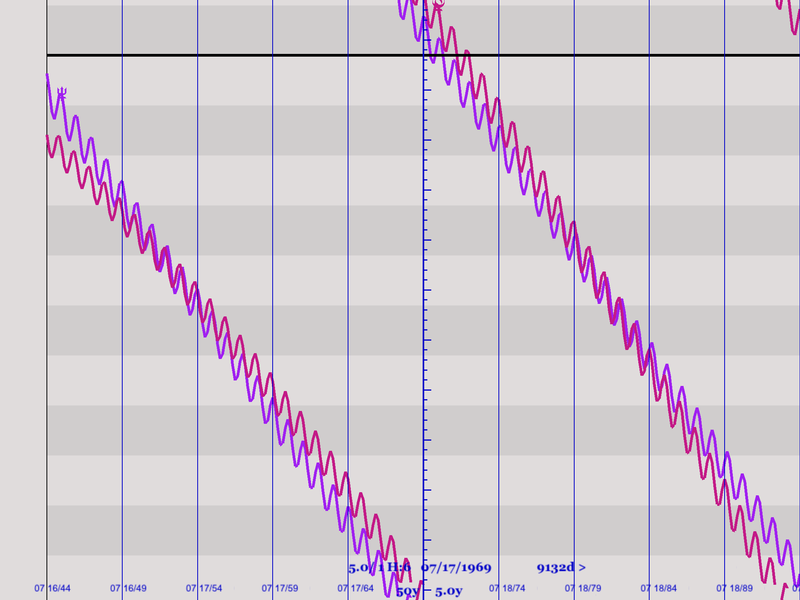 The blue wavy line is transiting Uranus, and the other wavy line is the transiting Neptune-Pluto midpoint. You can see they start to get very close at the beginning of 1978, are in contact through 1979, and separate in 1980. The other chart near the top is a standard wheel for a specific time. In that you can see clearly Uranus at the midpoint of Neptune-Pluto. This was the third and last midpoint involving the three outer planets this century. The previous two midpoints, which have already been discussed, were in the first decade of the Twentieth Century and at the end of World War II. The operative aspect during the Cold War was what is called the Long Sextile between Neptune and Pluto. Pluto is an oddity among the planets since its orbit is very eccentric so that at some times it travels much faster than at other times, and once every 250 years it goes inside the orbit of Neptune so that it is no longer the outermost planet. That happens appropriately when, since Pluto is considered to be the ruler of the sign Scorpio, the planet is in the sign Scorpio. This happened between January 1979 and February 1999, with Pluto closest to the sun (perihelion) half way between those two dates. As the result of this, the sextile between the two planets lasted a very long time, and it will return in another decade, but that is an important topic for another time. As a result, this is called the Long Sextile. The first two charts illustrate a typical sextile between the two planets , one from 1950 near the beginning of the Cold War,and one for 1980, thirty years later when the Cold War had warmed up again. In both charts notice the blue line representing a sextile between the planets Neptune and Pluto. 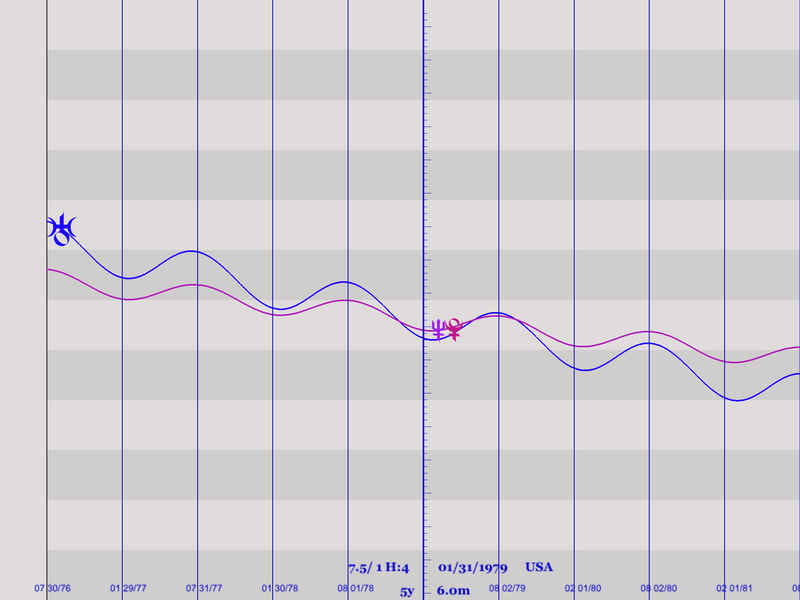 But the real proof is in the graphical ephemeris shown below. This graphical ephemeris covers a fifty year period, between 1944 and 1994, and shows in the sixth harmonic just two planets, Neptune and Pluto. 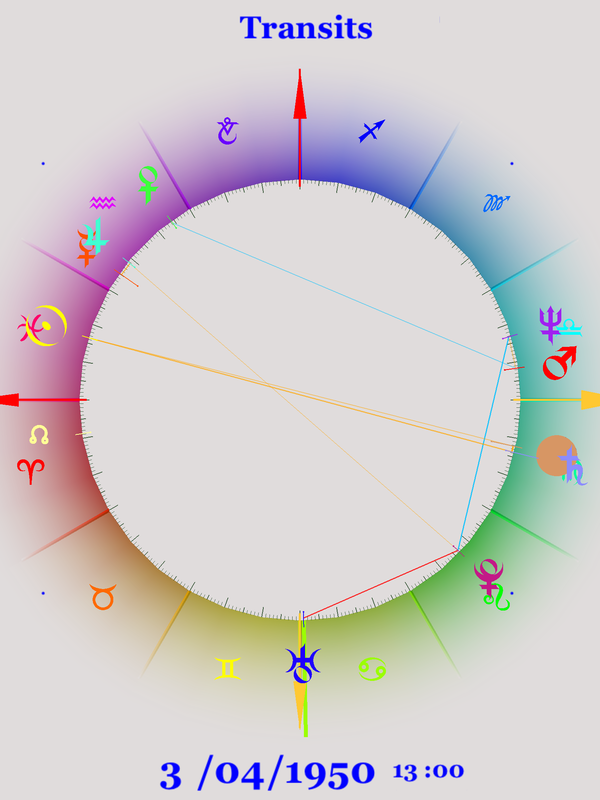 We know that in a sixth harmonic chart, planets that are exactly sextile show as conjunctions, or lines that are together in the graphical ephemeris. From the graph we can see that the two planet first came close together in 1946 or 1947, stay close together until they finally separate in 1991 or 1992, mirroring the extent of the cold war that lasted all those years. We also notice that the lines get very close together in he early Fifties, just as the Cold War was getting intense with the successful Communist victory in China, the Korean War, the first successful atomic bomb explosion by the Soviets, and in the United States McCarthyism. The other time the planets are very close together is in the early Eighties with President Ronald Reagan, when defense spending greatly increased, when he talked about the military plan called “Star Wars” and helped the fights in El Salvador and Nicaragua. Also notice that the two lines, representing Neptune — blue– and Pluto — red in the late Sixties, early Seventies are further apart. This is when President Richard Nixon was practicing the policy of détente with the Soviet Union. One important treaty negotiated during this period was called SALT I for Strategic Arms Limitation Treaty. This was in the works between late 1969 through 1972. On May 26, 1972 an Anti-Ballistic Missile Treaty was signed between Richard Nixon and Leonid Brezhnev. Also in this period was the famous “Nixon Goes to China” moment when Richard Nixon when to “Red” China, something that was unheard of before then, and the subsequent recognition of China by the United States and then the admission of mainland China to the United Nations, something that had been blocked (mostly by the United States) since 1949. In fact, it was because the Soviet Union was not in the United Nations Security Council in 1950 to protest the exclusion of China from that body that allowed the United States to have the United Nations approved the start of the Korean War. As we’ve seen previously, a midpoint involving the three outer planets represents a watershed moment. For the midpoint that indicates the start of the Cold War, this is certainly true. It was a bifurcation point in the flow of time, where the future was radically different that it would have been without the Cold War. The Cold War has affected the whole world and the way it behaves, in ways unimaginable and not really seen at the time it started. But by now the “official” Cold War has been over for almost a quarter century. We are living in a post Cold War world, but the effects of the Cold War has changed the way we response to most everything. America has always had enemies, someone it could dominate and rail against, someone that the people at home would draw together against. For much of the early years of the country the enemy was Great Britain, the country it was a colony of for a long time, and finally rebelled against. The US then had another war against that country a quarter century later. But by the time of the Spanish-American War, the enemy was that by then decrepit empire Spain. This served as an enemy until the Huns in World War One intervened. But at the end of that war there was the Russian Revolution and they became the official enemy, a status that has endured even though the official Cold War has supposedly ended. One historian (Gordon Wood, The Idea of America) has an interesting theory as to why the Russians were so hated after their Revolution. For over a century after the American Revolution, America is where anyone considering a more democratic country would look. It was almost as if the definition of revolution was illustrated with a map of America. But after the Russian Revolution, this was no longer the case. After that act, when people though of revolution, they thought of Russia. We were no longer the top dog in the Revolution-definition business. Russia had stolen America’s thunder, and America was not about to allow that to happen. After the Soviet Union ceased to exist, America searched for another enemy to take its place. The first choice was the menace of drugs, come to steal out precisions bodily fluids. That audition did not go over too well, and fortunately 9/11 allowed America to bring back a bogeyman that Ronald Reagan declared war on 20 years earlier, but this time it seemed more real and was brought home to Americans on their television screens, the window to reality. This new threat was terrorism, and so a War on Terrorism was declared. Some people pointed out the difficulty in declaring war on a noun, and that terrorism was a tactic, and some even pointed out that America was the largest purveyor of terrorism, but none of those arguments held much sway with the American people. In fact, the argument became are you for the country or for the terrorist, just like in previous times the question was are you for us or the Communist. It was a black and white world. It won’t be for several hundred years, when we are able to look back at the Cold War as a historical period and not as a entity which has just recently passed, and maybe not really, that we can see this period is one of insanity. It changed drastically where money was spent, so that trillions were sent to defense companies, making their owners very wealthy, which reduced the amount of money available for most of the people. As President Eisenhower said “Every gun that is made, every warship launched, every rocket fired signifies, in the final sense, a theft from those who hunger and not fed, those who are cold and are not clothed.” These days that certainly sounds like Communist propaganda, and the person who said is not fit to be allowed in society, but Eisenhower was a Republican President and a war hero of the Second World War. That one quote shows how much things have changed in the last sixty years. We are now in the post Cold War world, but having the Cold War as such a prominent feature of the world for so long — 45 years — has changed the way people think. Our first response to any problem is to send in the weapons, if not “boots on the ground” then at the very least a few bombs, missiles, or drones. The world has developed so that the killing of strangers because they happen to be in the wrong place at the wrong time does not seem worthy of comment, and the interception of all personal messages seems perfectly normal. In fact, supporters will often give praise, or at least find an excuse, when their leader does any of that.